Figaro (AKA "Figgy") was a vigorous adult male cat, mostly black, with narrow white patches between his front and back legs. He spent the spring and summer of 1998 roaming the area near my day-job workplace. This was not exactly a bad existence, as he was being fed by employees of 2 area businesses, in addition to the folks at FLEET (now called VEMA). He also thoroughly terrorized the neighborhood´s rodent and bird population. He was with us for a bit more than twelve years. As you can see at left, he had a knack for getting into trouble! He was an active, athletic, and somewhat crazy critter, who got much sweeter in his old age (except when he had to see the vet). His favourite place to spend the night was on Martha's pillow, often crowding her head to the point where she had to get up and find a second pillow for herself. When she was out of town, he sometimes graced me with the honor of warming my bald scalp with his vibrating, warm tummy. But usually he was her "pillow buddy". 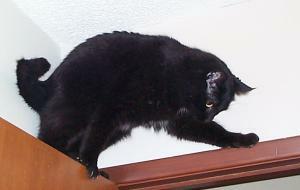 In August of 2008, Figaro's first "senior cat" annual checkup revealed some bad news. He had developed feline pancreatitis, with which he lived for another couple of years. Always a bit of a careful eater, he began eating less and less, lost a lot of weight, and got downright feeble. Finally, when he stopped eating altogether, we knew his time had come. We said our goodbye to "Figgy" on October 16, 2010. A few months prior to that, my iPhone camera was able to capture what became my personal favorite image of him "helping" me at the computer, an arduous task which he performed often. 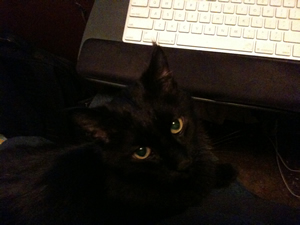 He was a good kitty, and a top-notch lap-warmer.